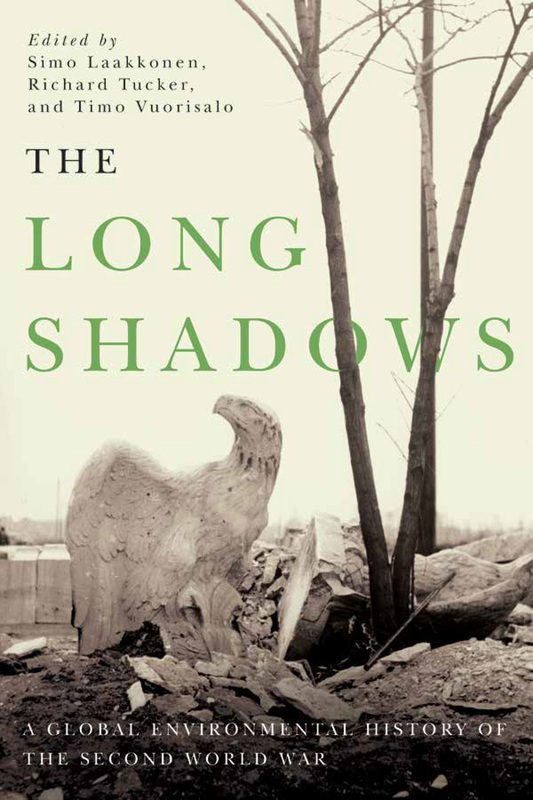 Simo Laakkonen, Richard P. Tucker, and Timo Vuorisalo are the editors and compilers of the many essays that make up this spring's The Long Shadows, the first book of its kind to explore the environmental history of World War II with comprehensive global perspectives. Each essay represents the best studies among varying fields and countries, with contributions throughout Europe, America, Asia, and Africa. The book is comprised of four parts. The first part is an introduction and holistic overview of the war; the second examines and analyzes the environmental and social impact felt from the war; the third focuses on resource extraction; the final part offers conclusions and hypotheses. Today, readers will have an inside look at an excerpt from Part 1: Introduction; Chapter 1: The Long Shadows. Warfare has a history as long as humans have lived in organized societies. In Europe alone, by one author's calculation, 5,800 wars were fought prior to World War II. Although World War II was exceptional owing to its scope and destructiveness, it is part of the historical phase in the development of modern warfare. In modern industrial warfare, communication, transportation, armament and other stockpiling and supply, and military operations themselves rely on technological-scientific product development, industrially manufactured products, and societies' economic production capacity. In industrial wars, new types of weapons-- rapid-load firearms and explosives-- have led to massive casualties in open battlefields. These unsustainable casualties, for their part, have forced the troops to break up, dig into the surrounding terrain, and build defensive devices. Because of the resulting cycle of armament, the victory in encounters between mass armies was to a large extent decided by their comparative industrial-economic production capacities. Industrial warfare on a devastating scale began during the American Civil War (1861–65), the first war whose environmental history has been studied intensively. Industrial warfare reached Europe during the same years, in the Crimean, Austro-Prussian, and above all the Franco-Prussian War (1870–71), in which Prussia's success was achieved by total warfare, the mobilization of all the country's material and immaterial resources to the service of war. This process began to spread worldwide in the last decades of the century, as the industrial powers and local elites finally crushed native resistance-- for example, in southern Chile (the Mapuche), the Great Plains (the Lakota and other tribes), British South Africa (the Matabele), and New Zealand (the Maori)-- and competed with each other for control of African and Southeast Asian colonies and their natural resources. Yet there are few studies of the environmental history of warfare in Europe and colonialism prior to World War I. The complex environmental legacy of World War I is only now being address in any focused way. This is the case also with the Spanish Civil War and Japan's attack on the Chinese mainland in the 1930s. Research interest in the environmental impacts of wars and even peacetime military operations was aroused by the radioactive fallout from the nuclear testing of the 1950s and 1960s, in the wake of the atomic bombs dropped on Hiroshima and Nagasaki. In the 1960s and early 1970s, the world's first televised war brought to screens the deforestation that the United States caused in Vietnam with bulldozers and herbicides. Concern for the environmental changes resulting from war arose again during the Gulf War (1990–91), when images of hundreds of oil wells ignited by the Iraqi Armed Forces were broadcast around the globe. In the late 1990s, all of Europe watched, hearts chilled by both the environmental and human toll, as the Balkans slid into civil war. The US-led allied assault on Iraq in 2003 was the first war preceded by discussions of its probable environmental consequences, even if studies conducted during the war itself could only be fragmentary. Wars fought in the developing countries of Africa, Latin America, and Asia have also shined a media spotlight on the ravages of oil drilling, deforestation, mining, and poaching of endangered animals such as the mountain gorilla. Many were "resource wars," fought over control of valuable natural resources and the riches that came from extracting and exporting them. There has been much discussion on the relationship between natural resources and wars, but the historical perspective has been insufficient. Because of the dearth of research, in practice, all wars fought throughout history continue to be "unknown wars" from the environmental perspective, and the people who have worked on behalf of the environment during wartime conditions remain "unknown soldiers." Yet throughout the industrial era, many participants who were caught in conflicts paid written attention to the environmental effects of war. If scholars have neglected the relationship between war and its imprint on nature, soldiers and civilians have not. Diary entries, newspaper articles, reports, photographs, newsreels, films, and works of art demonstrate that both soldiers and civilians consciously observed war time destruction in their immediate vicinities as well as in the natural world. For instance, soldiers monitored birds, installed nest boxes, reared fledglings, and even reported on birds' singing activity during military operations. Apparently war did not prevent people from observing, enjoying, and loving nature; rather the contrary. How has contemporary scholarship answered this challenge of environmentally "unknown" wars? World War II encompassed economic, social, and cultural dimensions. There is a vast literature on those dimensions of the conflagration. The environmental consequences and legacies of modern wars are only beginning to be studied systematically. As research in environmental history has focused on peacetime developments, until recently neither war nor wartime had been considered a prominent subject of environmentally themed study. The environmental history of wars has thus ended up in an academic no-man's-land between two traditions of historical research: the history of war and environmental history. In recent years, approaches to research on the history of war have expanded appreciably, but even so, the environmental consequences of mass violence have remained largely unexamined. Military historiography and geography have long and carefully analyzed the environmental settings of conflict in the course of strategic planning. The environmental impact dimension has been studied only obliquely or fragmentarily, but nature conservationists have paid some attention to the importance of warfare in transport of potentially harmful species or substances between regions. Broad examinations of the interplay between war and the environment through history have been conducted primarily in the United States, Germany, and Finland. The full range of industrial warfare has been addressed in two pioneering collections. There are not enough relevant studies on wars, even recent ones, to form a comprehensive picture of their environmental effects. And the deeper we travel into history, the less we know about these effects. This also holds for World War II; a few articles have been published about its environmental history, and some books have touched on the period. There is no global environmental history of World War II, however, though the political and military history of World World II has been massively chronicled. This book is the first work that strives to open global perspectives specifically on the environmental history of that global war. The magnitude and long geopolitical shadow of World War II are obvious reasons to study its environmental history. The industrialization of warfare came to a climax in World War II, which has a unique status among the wars of the world. It engulfed 1.7 billion people, three-quarters of the world's population. The war was waged on almost all continents and in the polar, temperate, and tropical climate zones. It was the world's most destructive war, claiming fifty to seventy million lives. In addition, the war injured hundreds of millions of people and innumerable other living creatures. The worldwide cost of World War II is estimated at about $1 trillion, making it in its day the most expensive war by far. World War II changed the political map of the globe. It also propelled the human race into the Atomic Age. Co-author of The Only Woman in the Room, Pat McCord Amacher joins us today to follow up on Gail Wells' reflections on the challenges they met while attempting to immortalize Oregon lawyer and politician, Norma Paulus. Amacher offers the perspective of a non-native Oregonian while sharing the strategies she and Gail Wells used to document, present, and preserve the extraordinary life and achievements of Paulus. Unlike Gail Wells, who had enjoyed a lifelong submersion in Oregon history, I'm not from around here. When she told me about the Norma Paulus project in 2013, I had made a little progress toward shrinking the massive gaps in my spotty knowledge of the state by writing a biography with Gail of an Oregon timber family. I realized after researching the family's sawmilling history that I seemed to be evolving as an Oregonian, no longer merely a Midwestern transplant, among multitudes of others from "back East," who raised her kids here and learned about the Oregon Trail from their elementary-school curriculum. I finally felt settled. This epiphany both surprised and pleased me, adding greatly to the pleasure I gleaned from working with Gail, a fine writer as well as an informed citizen. When Gail offered me the chance to work with her again, on Norma's book, I viewed the forging of another building block in my cultural literacy as one of the job's loveliest perks. So we began, slowly at first. After reading the oral histories taken with Norma by Linda Brody and Clark Hansen, Gail and I set about building the context for the story Norma told. We were allowed free access to her voluminous archived papers at Willamette University, and accepted eagerly, perusing boxes of documents and minutiae, from news clippings to greeting cards to notes passed on the floor of the House, while the hours flew by. Each time we had a library day, Gail and I marveled at how we loved the task, and not only for the color and confirmation the precious boxes afforded to the narrative. Norma's papers provided a veritable parade of illustrations for her oral history that greatly enriched it, inching us ever closer to a grasp on the complex portrait we were hoping to create. We enjoyed a similar experience on our "field trips" to the Oregon Historical Society, where we plundered the Norma Paulus Papers, scribbling notes and ordering photocopies of the widely-varied clippings and correspondence gathered there. Another dimension of Norma's story was disclosed throughout the extensive audiotapes from Russell Sadler's interviews, both one-on-one with Norma and with a number of key players from her chronology. Then we talked to the players and her family members themselves, when we could, revealing yet another layer of our subject and sharpening its clarity. Lastly, we conducted good old-fashioned research with secondary resources, a task all the more rewarding as the final step in the construction of Norma's story-- her book. Holding it in my hands now, I feel Norma Paulus has given me a wondrous gift, and one I never dreamed of when I arrived in my strange new home: the opportunity to study Oregon history virtually at the knee of a great Oregonian, who lived it and spent most of her life creating it. I could have found no finer guide to follow. Author Gail Wells joins us today to reflect on her and Pat McCord Amacher's work to help tell the story of Norma Paulus, the first woman to be elected to state-wide office in Oregon. The Only Woman in the Room provides an unprecedented look into Paulus's life and work-- a career in public service that spanned nearly 30 years-- with lively anecdotes that will appeal to everyone from historians to everday citizens. When Jennifer Viviano called me in the spring of 2013 and asked me to collaborate on a biography of her mother-in-law, Norma Paulus, I eagerly accepted. I admired Norma, and that would have been reason enough. I also relished the prospect of another tour through that brief, bright time in Oregon politics, the mid-1960s through the mid-'70s, when Governor Tom McCall and a forward-thinking legislature seemed to be moving our state into a new era of equality, prosperity and environmental health. I came of age in Oregon during those years, a bookish, idealistic high-school girl. I'd revisited the territory four decades later when I collaborated with Betty Roberts on her autobiography, With Grit and By Grace (also part of OSU Press's Women and Politics in the Pacific Northwest series). Betty was a Democrat and Norma is a Republican, but they were sisters across the aisle-- key members of a feisty legislative women's caucus that helped pass landmark laws that ensured women's and consumers' rights and established an enduring (so far) land-use planning system. They were women I looked up to. I was grateful to be invited into their world long enough to help each tell her story. I discovered, however, that telling Norma's story presented a distinct challenge. She had recorded many hours of oral history, and there were boxes and boxes of documents-- newspaper clippings, floor notes from her time in the legislature, campaign memos, transcripts of speeches, meeting minutes, and other materials. But she had not written a manuscript, and by the time Pat and I got to work she was in poor health and was unable to sit for any more interviews. So, with her and her family's blessing, we reconstituted her story from the oral history and other materials, augmenting these with interviews of friends and family members. We did not try to "be" Norma; we didn't feel comfortable ghosting ourselves in a false first-person narrative. So we told the story in the third person, using our own words, but always striving to infuse the storytelling with Norma's spirit. With all due modesty, we think it's a terrific story. Norma gets the credit for that, of course. She was certainly a pioneer for women in public life, but she is also a complex and extraordinarily interesting person. We did our best to let Norma's light shine through the simple, prescribed contours of "role model."